Tim Lincecum wants a near record amount in arbitration. The Cardinals are in negotiations with the man who recorded the last out of the 2011 World Series, and MLB welcomes a Ham-Fighter. 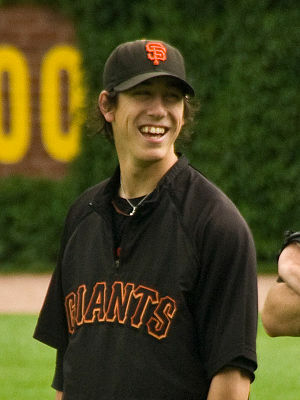 Tim Lincecum is eligible for arbitration this year and has requested a $21.5 million salary for 2012. Roger Clemens holds the record when he requested $22 million from the Houston Astros in 2005. San Francisco offered $17 million as their counter offer, which set a record for highest offer by a club, breaking the $14.25 million the Yankees offered Derek Jeter in 2001. Whatever Timmy gets, it should be enough for a fresh bag of reefer. The Giants also locked up slugging third baseman Pablo Sandoval for three more years. Sandoval and the Giants agreed to a three-year $17.15 million contract. Kung Fu Panda batted .315 with 23 homeruns and 70 RBI in 2011. Although Panda provides pop in the middle of the lineup, the Giants ranked last in runs scored and second to last in team average in the NL in 2011. Getting Buster Posey back from a leg injury will boost the Giants offensively. The Philadelphia Phillies and Cole Hamels agreed on a $15 million one year contract, which avoids arbitration. Hamels went 14-9 with a 2.79 ERA last year with the Phillies. He is a free agent after the 2012 season and is expected to sign a multi-year, $100 million contract. The Phillies may not be so generous. He would be the Phils fourth $100 million player along with Cliff Lee, Roy Halladay and Ryan Howard. The Texas Rangers signed Yu Darvish nearly one month after they won the posting bid at $51.7 million to negotiate with the Japanese star. The deal reportedly is a 6 year $60 million deal. The Rangers have $111 million invested in Yu Darvish. The $51.7 million posting bid that the Rangers must pay, now that they signed Darvish, goes to his old team, the Wippon Ham Fighters. Who the hell fights ham? Darvish, 25, went 18-6 last season with a 1.44 ERA and 276 K’s. Jamie Moyer is awesome. Moyer, 49, signed a minor league contract with the Colorado Rockies this week. Moyer msised all of 2011 due to Tomy-John surgery. If someone is going to give him a contract, why wouldn’t he take it? More power to ya, grandpa. The Dodgers had a busy week for a team without an owner. Clayton Kershaw of the Los Angeles Dodgers, who is arbitration eligible for the first time, requested $10 million in salary for the 2012 season. The Dodgers countered at $6.5 million. Kershaw made $500,000 in 2011. The $6.5 million the Dodgers offered is second all time for first year arbitration eligible players. Andre Either and James Loney were each able to get one year deals done with the Dodgers this week. Either signed for $10.95 million and Loney agreed to a $6.75 million deal. The Dodgers arguably have the best young duo in Kershaw and center fielder Matt Kemp. 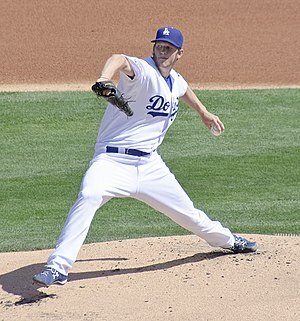 Kershaw won the 2011 Cy Young and the National League Pitching Triple Crown. Kemp finished second in the MVP voting to juicer Ryan Braun. Whoever buys the Dodgers, whenever that is, is getting one heck of a nucleus. The St. Louis Cardinals signed reliever Kyle McClellan to a one year deal worth $2.5 million. 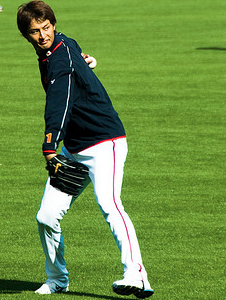 McClellan was forced into the starting rotation in 2011 when Adam Wainwright went down. He will be back in the bullpen in 2012, where he is most effective. The man who got the last out of the 2011 World Series, Jason Motte, is eligible for arbitration and has requested $2.4 million in salary for 2012. The Cards countered with $1.5 million. Barring any drastic moves, Motte will be closing games in 2012 for the World Champs. $500,000 for Kershaw? Are you kidding me? What. A. Stud. Clayton Kershaw is an ace and he’s 23 years old. Put this into perspective … Adam Wainwright is 30 years old … and broke into the league in 2005. Wow, what an asset the LA Dodgers have in Kershaw. I thoroughly enjoy watching a fellow lefty dominate.